If one of your New Year's resolutions is to be more mindful, adopting a meditation practice may be just the ticket to help you achieve this goal. Especially if you live a busy and hectic life (and who doesn't? ), it's important to find peace of mind in moments throughout your day. Not only will it better ground you and bring you closer to your feelings and emotions, but it will help relax your nervous system and aid your overall health since you'll experience less stress on a daily basis. Depending on the spiritual discipline, a meditation practice can take many different forms, from simple breathing techniques to chanting complex mantras, says Kerri Axelrod, certified integrative nutrition health coach and yoga instructor. "One common principle among different disciplines is using the practice of meditation to access deeper brain wave states, which is primarily what I focus on with my clients," she says. "A consistent meditation practice has been shown to reduce anxiety and stress, help clear distracting thoughts and boost brain power." Not sure where to begin on your meditational journey? 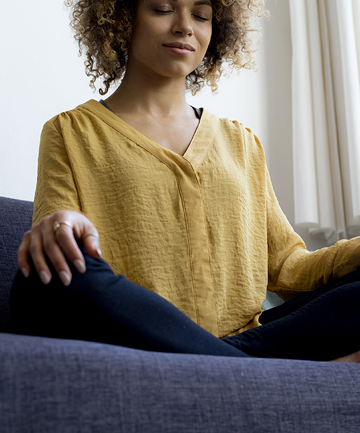 Read on for our guide to how to meditate for beginners, using eight steps that fit your life.